Agriculture is Environmental Protection T-Shirt Available! Great Farm Shirt! New shirt in support of the agriculture industry. This shirt is all-organic cotton. I spend 99% of my time working with conventional agriculture, so I specifically chose organic in an effort to support other choices in farming. In my view all farming is good, just different approaches. And, if you prefer not to order an organic shirt the shirt choices are unlocked in Zazzle allowing you to order a different style of shirt. This is a classic t-shirt design made with 100% organic jersey cotton. The shirt is made in the USA by American Apparel. I’ve also added ‘via @chenx064 on Twitter’ to give Dean Chen appropriate credit and for you to show how ‘hip’ you are knowing about Twitter. (Including a Twitter username on Twitter t-shirts appears to be a standard practice). Disclosure: Zazzle has a minimum royalty of 10% paid to me for each shirt purchased (Zazzle would not allow me to set the royalty to 0%). As such, any royalties (if there are any) will be donated to an appropriate not-for-profit recipient of Dean Chen’s and my choosing. Enjoy! July 28, 2009 update: Jim Chen and I have decided to split the royalties from this shirt 50/50 to Ohio 4-H and Kentucky 4-H. Further, I will also match the total royalties dollar for dollar. This has been a neat project, and I am very glad to have participated. Entry filed under: environment, organic. 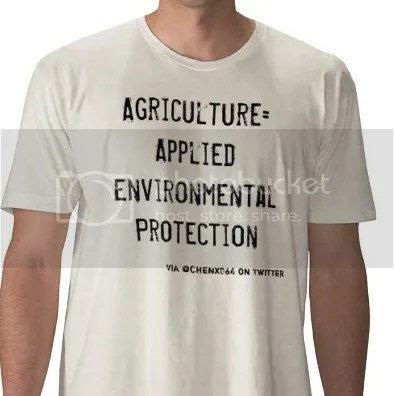 Tags: ag t-shirt, agriculture, agriculture is environmental protection, agriculture shirt, agriculture=environmental protection, environmental protection, farm shirt, farm t-shirt.